Thirteen years ago, Kimberly Grunberg was a mother of three young children and began working for a printing and promotional company. Little did she know that she had found an industry that she would love and it would eventually lead to her starting her own business. Last July, Kimberly founded Anything Printed – a company in Hagerstown, MD that provides literally anything printed. 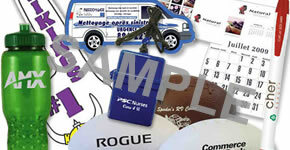 Anything Printed offers logoed apparel, uniforms and spirit wear to corporate gifts and promotional products. They also offer customized business forms, checks, envelopes, invoices as well as marketing collateral, presentation folders, printed binders, brochures and direct mailings. Anything Printed is a small business currently with three employees, but don’t let the size fool you. “We work hard to capture exactly what it is our clients are looking for and suggest fun and innovative promotional products to execute the ideas,” added Kimberly.